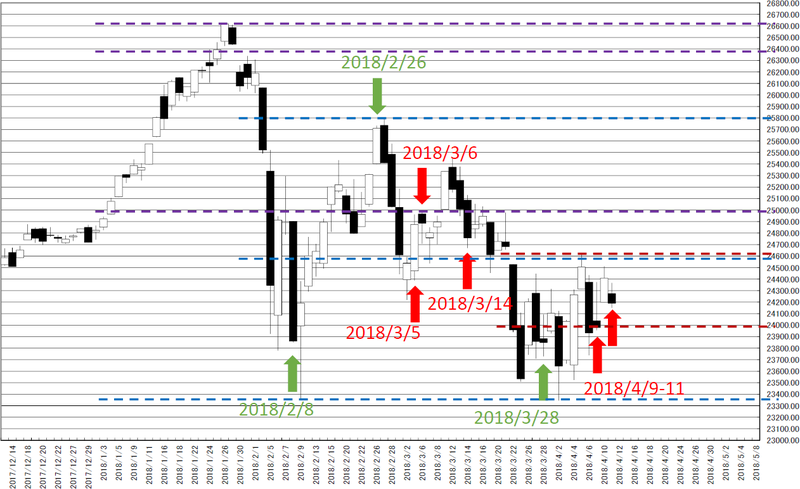 Dow Jones Industrial Average (^DJI) Daily; Now seem to follow past U.S. Presidential “HENKABI”; this market may have already peaked out and from end of April to mid-May will be “HENKABI”. Today’s analyze is Dow Jones Industrial Average (^DJI) Daily. Our conclusion is now seems to be bear market conducting from the relation between the President’s inauguration and DJI. Calculation of “HIGARA” will be next time. 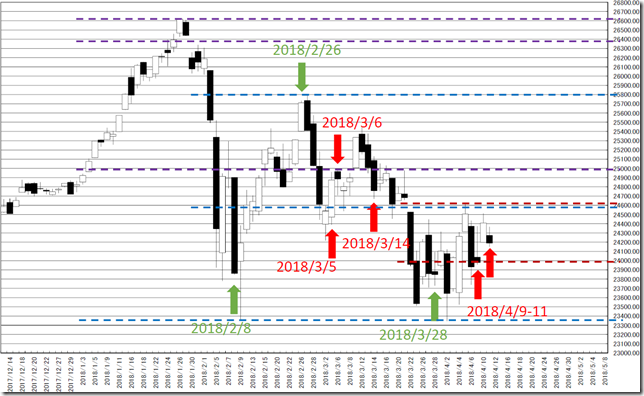 We reported “Dow Jones Industrial Average (^DJI) Daily; There are many “HENKABI” days in this month; we cannot become bullish until cutting 25000 point over” in 3/6/2018. 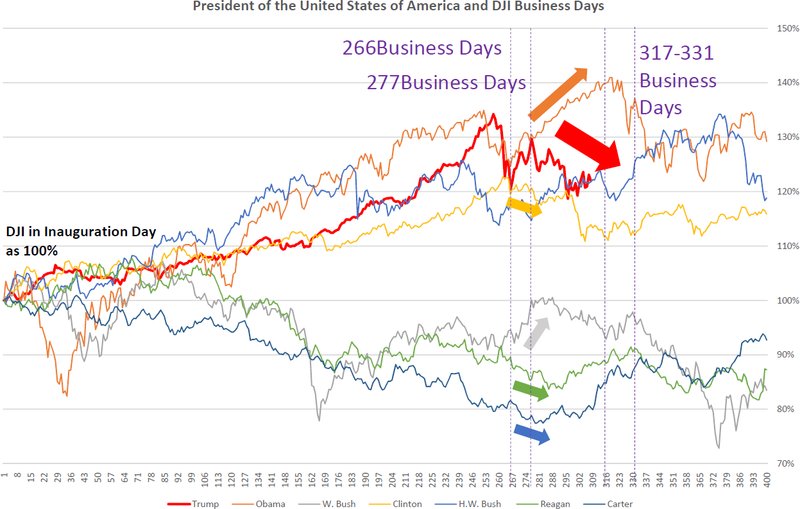 And we also reported “Dow Jones Industrial Average (^DJI) Daily; Following past U.S. President again, “HENKABI” is 3/28/2018” in 3/7/2018. Green points are we pointed out about the relation between the President’s inauguration and DJI. 24600 dollar seems to be the major “HALF” price and now is lower than it and this seems to be bearish signal. The price movement is similar to the past U.S. president. 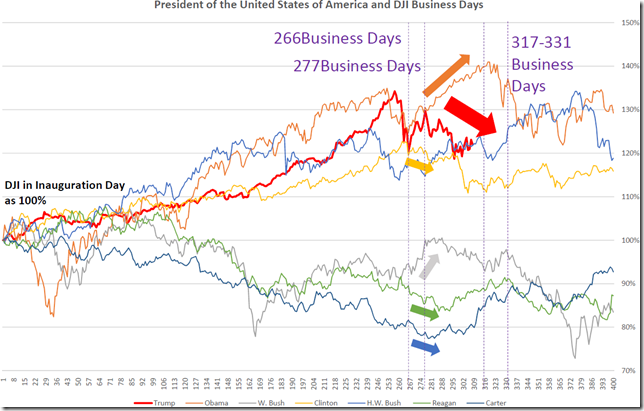 The price started to fall from 266 to 277 business days and this was bearish signal. From 317 to 331 business days will be “HENKABI” zone and it will be a big movement. This market has already double dipped and if the price will take new low, this occasion will be stimulus.